You may wonder why confession prayer is key. Sin and guilt are a poisonous pair. If they are left to their own devices, they destroy the entire man. Ministries are derailed by secret sin that holds men and women back. Marriages fail because of sin and resulting guilt. Sin is walking outside of God’s will. It is doing what we know we are not supposed to be doing. The Holy Spirit convicts us. We live in times where we are told that we should do as we please. You only live once right? That one time must be done right. There is no doubt that we fall short of God’s glory. We fail him, as we fail ourselves. When we hide our sins, our conscience eats at us. This is how we may end up finding ourselves to be ineffective in ministry. You cannot pray earnestly, when you know there is guilt in the back of your mind. We are taught to go and make things right with our brother before coming before the Lord. This is probably one of the most quoted verse in Christian circles. The only problem is that the latter part of the verse is what we love to quote. We love the fact that effectual fervent prayer of a righteous man availeth much. The key to this is the start of the verse. Confess on to another. When you confess, your sins are out in the open. They can no longer hold you hostage. Confession goes beyond our sin. It also includes confessing our belief in the Lord. Saying what we believe is important. Putting heaven and earth on notice. God promises that when we do these things, we will be saved. Let us make this practical. We will consider the areas in our lives where we tend to fall short of God’s glory. There are things that have seared our consciences. Our communities and those that we keep around us often shape our belief system. This is what sway us from where we know we are supposed to be. When your conscience is seared, sin does not seem like sin. Our goal should always be to keep our mind focused on God alone. The church may lead you astray. Pastors will fall short, and lead you astray. These are the things that sear our consciences. The mentality that says “My pastor said.” Instead we should always be measuring the word of any man against that of the Lord. This is one of the most conscience searing issues we have today. We have believers that will support unrighteousness if it is branded with the name of their political allegiance. We have believers that will support unrighteousness if it is allied to their country. Where have you fallen short in that regard? What political and nationalist beliefs do you hold onto that do not sit well with Christ? Dear God, search my heart. 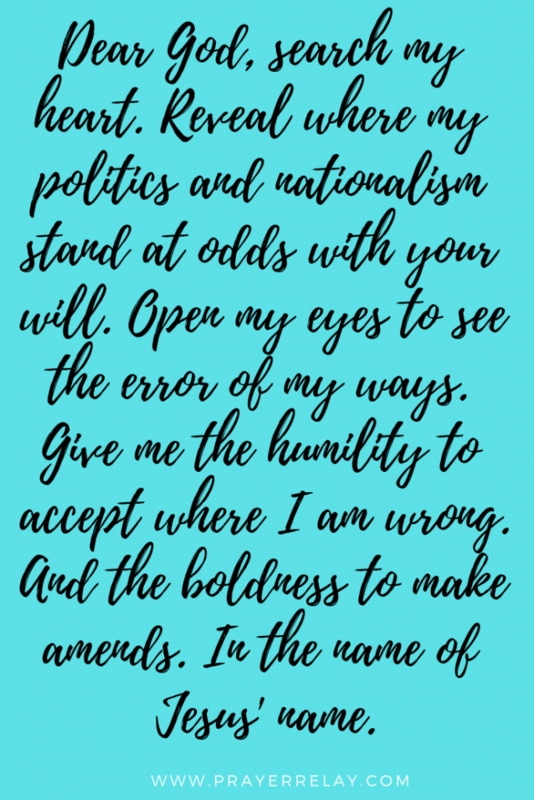 Reveal where my politics and nationalism stand at odds with your will. Open my eyes to see the error of my ways. Give me the humility to accept where I am wrong. And the boldness to make amends. In the name of Jesus’ name. There is no pleasing God in the absence of faith. Most of us would have had bouts with doubt. It doesn’t necessarily have to be doubting who God is or what he can do. Doubt may come in the form of not believing in God being able to or willing to change a situation. This is not something rare at all. The Bible tells us that Abraham, whom God referred to as a man of great faith had this doubt too. We know that God would ask him “Is there anything too hard for the Lord?” This is when he had waited for so long for Sara to conceive. 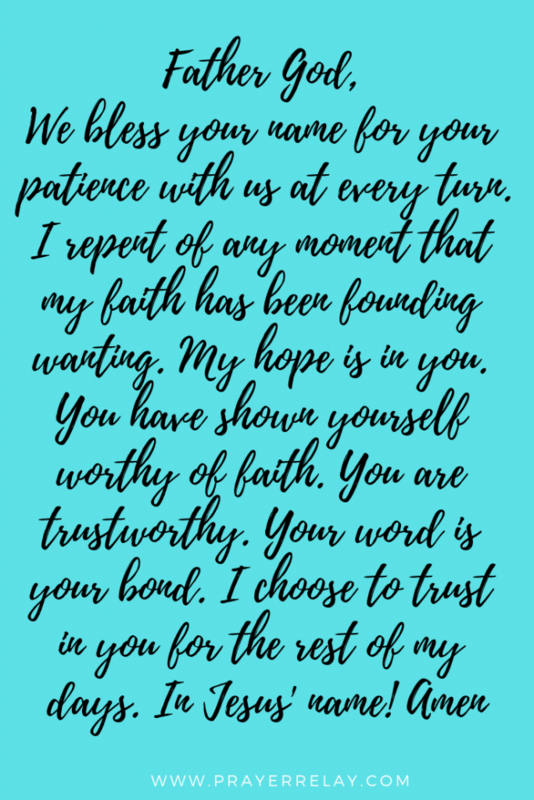 Waiting can be a great test of your faith. Hatred is a tricky one. It presents itself in many forms. Sometimes fear is a form of hatred. The difficult part in all of this is that most of the things that we hate are things that we have been brought up to hate. We are taught to fear certain things, certain people. This is something that we then carry throughout our lives. You will find churches that teach us to hate. Church hate is not an express form of hate. We are simply raised to view other denominations as being inferior to ours. Our leaders are exalted in our eyes, while every others’ leader is minimised. Until you think of this from the inside, it may seem absurd. Yet, a church is a numbers game. It costs money to run church events and maintain buildings. This means the pastor’s personal goals can easily become more important than KINGDOM goals. We may find ourselves at a point where we don’t win souls but take from other ministries. “A time will come when instead of shepherds feeding the sheep, the church will have clowns entertaining the goats” – Charles Spurgeon. I believe that time is now. What we cannot afford to do as leaders is becoming caught up in it. As believers, we cannot be cogs in this unrighteous crusade. Dear Heavenly Father, You are love. As you are, so shall I be. I pray that hatred would never become a part of my being. Search my heart oh Lord, remove any hatred. Remove any unconscious bias that is causing me to treat others worse than I should. As Christ said, when they saw him, they’d seen the father. Let that be my testimony in this lifetime. May your love be visible to others through me. In the mighty name of Jesus! Amen. This is another big one. There are people that will have you believe that you cannot be against something and be with the Lord. Off the top of my head, Israel comes to mind. People will have you believe that not supporting Israel in all things is being against the Lord. I support Israel. Yet I would not support Israel in clearly unrighteous things. Politics polarises us to the extent that we can no longer see the unrighteousness of our own leaders, but that of others. Dear Heavenly Father, I bless your name for who you are. 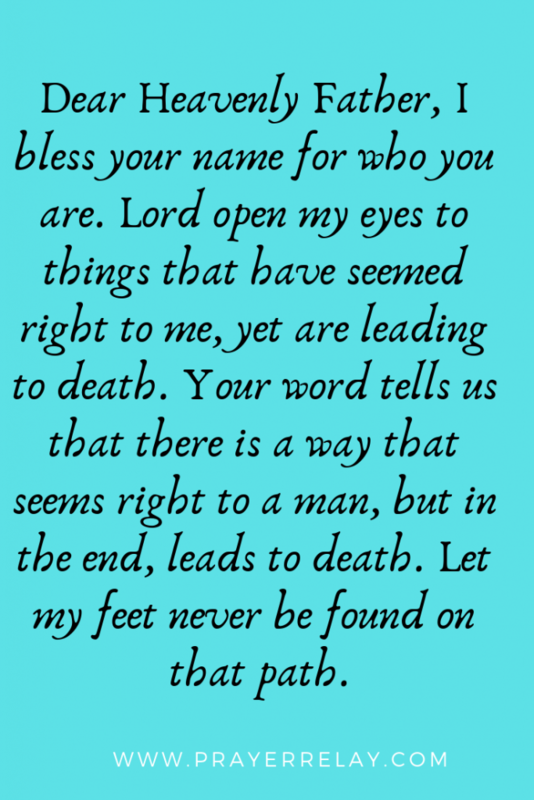 Lord open my eyes to things that have seemed right to me, yet are leading to death. Your word tells us that there is a way that seems right to a man, but in the end leads to death. Let my feet never be found on that path. Thank you for partnering us in prayer. Please check out our PATREON page, if you would like to help us do more.